Quick & Easy Vegan Oven Baked Pizza Grilled Cheese. Hi Everyone. I hope November is faring well for all of you, and Happy Thanksgiving! This is another spur of the moment recipe. It came together super quick, and is another very "spoonie-friendly" recipe. It also would be great for those nights where you just don't want to stand at the stove for forever. This would be a great recipe for your kids to get involved in, too! This would go well with salad, soup, or with some roasted vegetables, or some other side dish that you cook in the oven. You could start your other food, and then add the grilled cheeses to the oven during the last bit of cooking. These sandwiches turn out super well in the oven! 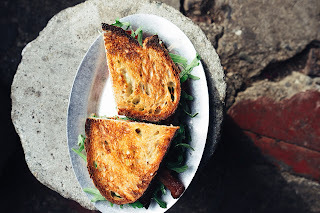 The bread has such a light and fluffy inner texture; compared to the "traditional" way of making a grilled cheese. Meanwhile, the outside has the typical crispy and savory deliciousness. You will need: cast iron, or other oven safe pans that can accommodate 4 sandwiches (a cast iron pan seems to give the best result for this), spatula/turner, a cutting board to assemble the sandwiches on (you could also use a plate, if need be), and a butter knife. Makes: 4 sandwiches. Prep time: 5 minutes. Cooking time: 20 minutes. This serves four people, unless you're like me, and want two sandwiches! Optional: a small amount of veggies of your choosing, this will make it more like "pizza." You could use olives, canned mushrooms, peppers, whatever you care for! 1. Preheat your oven to 375 degrees. Put the pans in the oven to start heating up. If you are using a pan that isn't non-stick, spray the pan well with cooking spray before placing it in the oven. The pan needs to be hot, so that the sandwich will start to sear and crisp up. 2. Start assembling your sandwiches: Place four slices of bread on your cutting board. Put about one-eighth of the bag of cheese, or one slice of cheese, on each slice of bread. If you are using veggies, place a small amount of them on top of the layer of cheese. You don't want to use too much, or the sandwich will not stick together. Then top with another eighth of the bag of cheese, or one more slices of cheese. Top with the remaining slice of bread. 3. Using your knife, cover the top slice of bread of each sandwich, with approximately 1/4 tbsp. vegan butter. 4. When the oven is preheated, very carefully, place the sandwiches vegan butter side down in the pan(s). 5. With one hand holding the top slice of bread down, cover each slice of bread with about 1/4 tbsp of the remaining spread. 6. Bake for 10 minutes, or until the cheese is starting to melt, and the bread is crisping up. 7. With care, Turn the sandwiches over, and bake for another 10 minutes, or until the bread is starting to brown, and it's heated through. 8. When they have just a few minutes left, warm your sauce in the microwave. 9. Cut the grilled cheese as desired into halves, or quarters, and serve with the heated sauce.